24 Hours to Midnight, as seen on BuzzFeed. While trawling Netflix we came across this TV movie gem, and were pleasantly unsurprised by how terrible it was. Sharknado stars Ian Ziering (Steve from 90210) as Fin Shepard, a seaside-bar-owning SOTA (surfer older than average) who also happens to be the ex-husband of April Wexler, played by Tara Reid. When three tornadoes form off the coast of California, Fin must make it to his estranged wife and 2 children in order to move them further inland to safety. Accompanying him are his lady bartender named Nova, and a sawny, bar-stool-wielding bar patron named George, played by John Heard (the dad from Home Alone). They soon come to realize that these are not just any three tornadoes; they’re three tornadoes FULL OF SHARKS FOR SOME REASON. 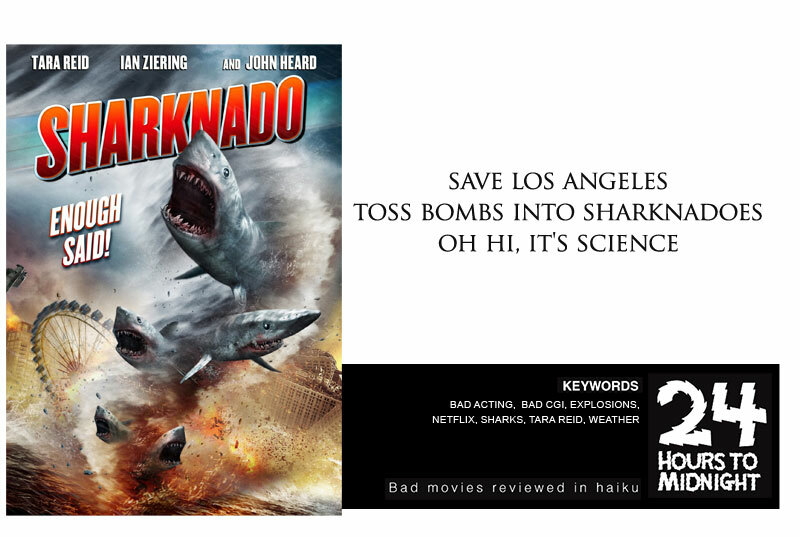 Seriously, tornadoes are flinging sharks everywhere, but instead of the sharks dying from being out of the water for any length of time, or the impact of being thrown from a tornado, they happily spend their last moments of life trying to murder people. Not only does this movie have terrible special effects, and terrible acting, it also blatantly pilfers from Jaws about twenty minutes in (which I not-so-secretly loved). I won’t ruin the ending for you, but it definitely involves flying a helicopter near a tornado (??? ), and Fin cutting his way out of a shark (???). IMDB says that people who liked Sharknado also liked Dragon Wasps (giant, fire-breathing wasps, according to it’s photo). Enjoy!